الخيار الأفضل للحصول على المتعة والاسترخاء، Hotel Sun Palace يقع في منطقة رائجة من أفضل مناطق المدينة. يحظى هذا الفندق ذو 2.5 نجمات بمكان ممتاز يسمح بالوصول إلى المعالم السياحية الأكبر في المدينة، فهو يبعد مسافة 1 km عن صخب المدينة. إن سهولة الوصول من الفندق إلى المعالم السياحية الشهيرة الكثيرة في المدينة هو استثنائي بحد ذاته. استمتع بالخدمات الراقية والضيافة التي لا مثيل لها بهذا الفندق في هذه المدينة رائعة الجمال. إن خدمة التنظيف يوميًا, مكتب الاستقبال على مدار الساعة, مرافق مخصصة لذوي الاحتياجات الخاصة, تخزين الأمتعة, واي فاي في المناطق العامة هي جزء فقط من الخدمات التي تميز Hotel Sun Palace عن باقي الفنادق في المدينة. بالإضافة لهذا، تتضمن كل غرف الضيوف مجموعة واسعة من وسائل الراحة . بعض الغرف توفر حتى تلفزيون بشاشة مسطحة, اتصال لاسلكي بشبكة الإنترنت (مجاني), غرف لغير المدخنين, مكيف هواء, مكتب لإرضاء أكثر الضيوف تطلبًا. يمكنك الاستمتاع بالأجواء المريحة التي تقدمها مسار جولف - ضمن 3 كم, غرفة ألعاب طوال النهار. يشكل Hotel Sun Palace بخدماته الراقية وموقعه الممتاز، قاعدة مثالية للاستمتاع بإقامتك في المدينة. No internet, No WIFI in the room, No soap, No shampoo, No hair drier, No drinking water, No coffee pot, Old TV, Leaking water from watercloset tank, Taping on the remote control, Woman's hair on the bed, Dark room, Several cracked tiles at Bathroom, Very small bathtub, Rusted faucets and shower hose. If you want to go Hotel Sun Palace, you will waste money. 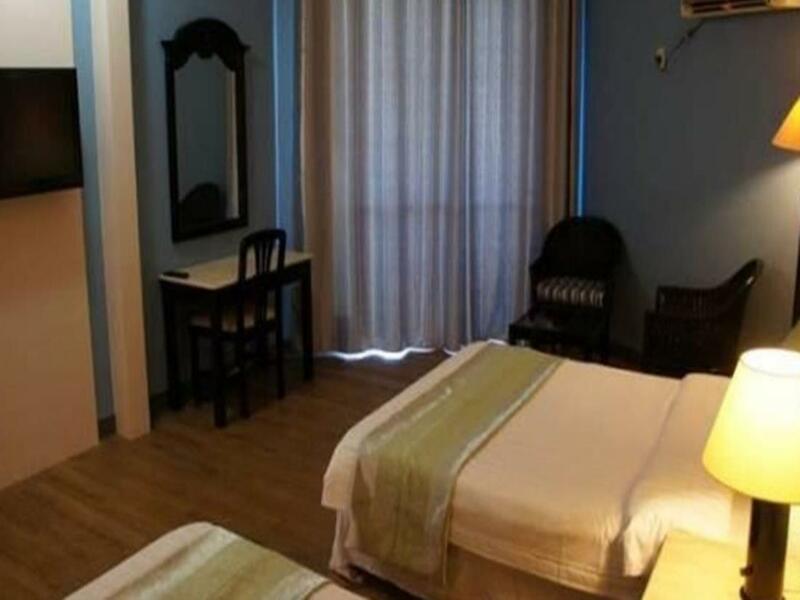 The hotel is far from downtown, you'd better rent a car before you decide to stay at this hotel.the room is clean but a bit wet.the stuff here are very friendly.low price,if you don't require much.it is worthy. The location is good, close by to the airport, stores, restaurants and the beach. The hotel and it's rooms are clean. The staff are attentive and friendly. Our stay was comfortable, relaxing and easy. We enjoyed the hotel surroundings, it was quite and relaxing. My kids were using the wifi most of the time, but they had to go out to the lobby because they couldn't get a good connection in our room. Other than going out to use the wifi, our stay was good. Its a really convenient place to stay. The only thing that does not meet my expectation is how these blankets are old, cable is snowy all the time, and no internet unless you go out to the lobby area. This is really not the type of hotel you would like to stay if you are so used to the wifi. Close to the airport, we just stayed here for one day after arriving past midnight. The facilities are somewhat outdated but the staff are friendly and willing to help (i.e., somehow we couldn't get the AC to work so we were baking in hotness for half an hour before the staff came along). The price is very affordable (considering we just booked it last minute) so I think overall it still offers good value for money, but definitely not for the high maintenance traveller. I had specific instruction that with time checking in and check out.. so I can have room at early morning and comfortable and also check out to catch Untied flight early in morning, However room was not given until noon,, an at check in wanted to book 2 days even had advance notice with my condition to book and reply in confirmation if not agree, or reply by email o me, Hotel did not reply nor bother to read special instruction. I also had written in advance I will write review about y stay and how it work. This is no place to book hotel in my View even it is free. that is how I feel now. I checked in at noon though having made another 6 hour stay at other place after describing what happen to r this place,, Another hotel who did y accommodation was free to me.. Very nice of them and was 3 star . his is way of earning business. Another place was not had room but fix for me and also have wonderful shower and clean bed.. Thanks to those hotel owner but not his one. Who do not read special instruction at Time of booking nor refusing booking if special need or instruction are not ACCEPTED BY THIS hotel. HOPE THIS INPUT AND Y EXPERINCE IS USEFUL TO OTHERS. GOOD LUCK!! Check in at 3am after driving on Beach road up and down for several times. The entrance small road and hotel sign are not easy to find in the night. My room is large, but the remote controller of air conditioning is broken, and remote controller for the TV is missling. It is lucky that I only stayed at this hotel for a few hours. hotel sun palace is really cheap and a close walk to the beach, but the room where we stayed had seen better days a long time ago. everything was old and worn out, so i think that it was difficult for the hotel staff to keep things clean because it was in such bad condition. the beach that was across from the hotel was not very wide, so it was almost impossible to lay on the beach there. Pros: Friendly staffs, honest people and clean Cons: Far from food source, No lunch nor dinner, requires own transport. it is near a school, and cross the road there is the sea. I like Sun Palace Hotel very much,in the future I will choose it again. Agoda! Please, drop this hotel. You should feel shame on it. It's terrible hotel. with curtains closed room was dark and cold. spacey room quiet neighbors. aside from the bathtub being so narrow it was ok.
No window in the room,　and wifi is weak in the room.